The Whoodle was bred by the crossing of two breeds: Soft-Coated Wheaten Terrier and the Poodle. 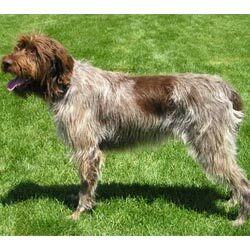 This breed of dogs is generally known as a designer dog and are quit rare in United States. This breed of dog is Sturdy and has a lively expression, they are very tough, brave and are true champions in their work. This breed of dogs is friendly and full of life, they are alert and suspicious of strangers. The whoodle dog breed do well with children and older people. This breed of dogs can be used as a house pet as they have a very sweet and nice nature. The coat of the Whoodle may be slightly wavy, profuse, soft and silky; curly; or a combination. This speedy and energetic breed requires early socialization and obedience training. They will not respond to hard and harsh methods of training, training should be done with fairness and patience. The Whoodle will do okay in apartments if they are provided sufficient exercise but they are best in rural settings with a job to do. They can be good in homes with a fenced yard where there is enough space that they can run and play. This breed of dog requires daily brushing to avoid dirt and dead hairs, bathing should be done when mandatory. They have a life cycle of about 12 to 15 years. As a dog owner it is your responsibility to keep you pet healthy and free of disease, if you see any symptoms of diseases affecting your dog please consult with a veterinary at the earliest.